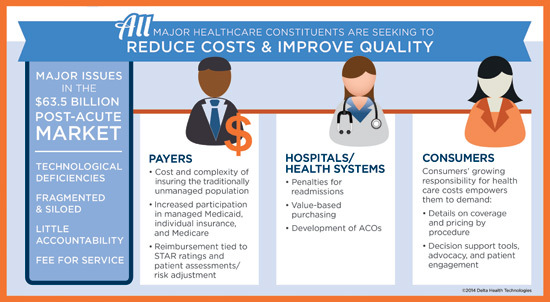 The infographic for part 4 of our Guide to the Growing Long Term Post-Acute Care market highlights the issues facing the long term post-acute care market. .
Post-acute care organizations account for 25-30% of healthcare costs and must be prepared to deliver a "value-based" service that aligns with the priorities of referring sources such as ACO's, health systems and provider groups. Stay turned for our last infographic related to the growing LTPAC market.